Search Minerals: Encouraging Phase … | Search Minerals Inc.
VANCOUVER, Jan. 25, 2013 /CNW/ - Search Minerals Inc. (“Search” or the “Company”) (TSXV: SMY) and its wholly-owned subsidiary, Alterra Resources Inc., are pleased to announce the results of the 1213 m NQ drilling program on the Pesky Hill Prospect, located 25 km southeast of Port Hope Simpson, Labrador, in the Port Hope Simpson REE District. The exploration drill program, designed to test the surface mineralization to shallow depth, intersected HREE-Zr-Y-Nb vein-hosted mineralization, similar to that observed on the surface. An additional drill program of 1,000m - 3,000m is recommended to help determine if substantial quantities of high grade HREE mineralization occur in the Zr Showing at the Pesky Hill Prospect. The Zr Showing contains some of the highest grade HREE vein mineralization (PHD-12-33) and is open at depth. Springdale Forest Resources (Diamond Drilling Division) carried out the drilling program. 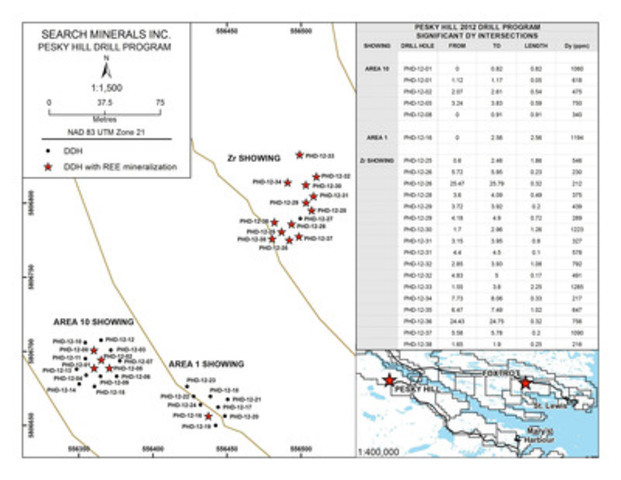 A total of 38 holes (26 to 50 m depth) were drilled in three separate showings (Figure 1 - Plan Map) to trace and sample high-grade mafic-rich, amphibole-pyroxene-quartz-titanite mineralization, and related granitic pegmatites and granites (see Search’s news release, March 1, 2012). These vertical drill holes were drilled approximately 10 m apart. Table 1 below lists Zr-Y-Nb-REE highlight results from the three showings. Values for Y range from 0.28% Y to 0.70% Y; for Zr from 0.68% Zr 1.42% Zr; Nb from 0.39% Nb to 1.02% Nb; Dy from 0.05% Dy to 0.13% Dy with HREE + Y for all holes from 59.8% HREE + Y (36.0% HREE) to 78.2% HREE + Y (58.5% HREE). HREE mineralization was intersected in 18 drill holes (see Figure 1- Plan Map). Mineralized veins appear to have a string-like geometry, with intersection thicknesses of the high-grade HREE zones ranging up to 2.56 m. The high-grade veins are associated with lower grade granitic pegmatites and anomalous REE-bearing granite. Small pegmatitic vein stockworks are observed near Showing 10. Results from the Zr Showing indicate that the HREE vein at this showing is open at depth and suggest further drilling is required. Additional untested HREE showings, with similar geological settings, also occur in the Pesky Hill area. The Pesky Hill Prospect is located near St. Lewis Inlet on the southeast Labrador coast. An all season, maintained gravel highway (Highway 510) is located about 5 km from the prospect, allowing access to the local port facilities, airstrips, and infrastructure at Port Hope Simpson, St. Lewis, and Mary’s Harbour. Access to the Pesky Hill Prospect is via a newly constructed 8 km long forest road. Drill core was transported from the drill site to Search’s Port Hope Simpson base where it was logged and split in half using a diamond table saw. One half of the core was kept in core boxes in the core storage facility for reference, and the other half was packaged and transported to ActLab’s Sample Preparation Lab in Goose Bay. Search representatives maintained custody of the core and samples at all times until they had been delivered to the lab. See Search’s July 27, 2010 news release for details of the sample preparation and assay methods. The Port Hope Simpson REE District, which is 135 km long and 4 - 12 km wide, contains both high-grade pegmatitic vein-hosted HREE mineralization (Rock Rolling Hill, Rattling Bog Hill, Piperstock Hill, Southern Shore, Toots Cove, Pesky Hill, HighREE Island and Ocean View Prospects) and larger, sheet-like, volcanic-hosted mineralization (Foxtrot Project and Foxy Lady and Fox Pond Prospects). The Foxtrot Prospect presently contains a NI 43-101 compliant indicated resource of 9,229,000 tonnes grading 189 ppm Dy (217 ppm Dy2O3), 1442 ppm Nd (1687 ppm Nd2O3), 1040 ppm Y (1320 ppm Y2O3) and 0.88% TREE + Y (1.06% TREO + Y2O3); it also has 5,165,000 tonnes inferred resource at slightly lower grades (see Search Minerals news release, November 1, 2012 and the technical report titled “Technical Report on the Foxtrot Project in Labrador, Newfoundland & Labrador, Canada”, dated December 14, 2012, each available on the SEDAR website under the Company’s profile). The Fox Pond and Foxy Lady Prospects and other areas in the Fox Harbour volcanic belt have similar volcanic-hosted mineralization and are currently being explored for additional Foxtrot-like resources. There are currently no resources outlined in the high-grade HREE vein-hosted showings. Dr. Randy Miller, Ph.D., P.Geo, is the Company’s Vice President Exploration and Qualified Person for the purposes of NI 43-101. Dr. Miller has reviewed and approved the technical disclosure contained in this news release as applicable. The company will endeavor to meet high standards of integrity, transparency, and consistency in reporting technical content, including geological and assay (e.g., REE) data. Search Minerals Inc. (TSXV: SMY) is a TSX Venture Exchange listed company, headquartered in Vancouver, B.C. Search is the discoverer of the Port Hope Simpson REE District, a highly prospective light and heavy REE belt located in southeast Labrador where the company controls a dominant land position in a belt 135 km long and up to 12 km wide. In addition, Search has a number of other mineral prospects in its portfolio located in Newfoundland and Labrador, including a number of claims in the Strange Lake Complex, where Quest Rare Minerals has an earn-in agreement with the Company; and at the Red Wine Complex, where Great Western Minerals Group has a Joint Venture with the Company. Furthermore, Search Minerals is the owner of patents relating to the Starved Acid Leaching Technology (“SALT”), a process with the potential to aid in the recovery of certain metals.